Huntingburg is a small town of 6,500 people that is located in Patoka Township in Dubois County. Located in the southwestern part of the state of Indiana at 38°17′49″N 86°57′16″W, this area of the state is less prone to the horrible weather in the northernmost parts of Indiana during the winter, staying between 20-40 degrees most of the colder months, and even boasts mild temperatures ranging from 70-90 degrees during the summer months. One of the most compelling things to know about Huntingburg is that it has its own airport. For such a small population, this is unusual. The Huntingburg Regional Airport was built by Frosty Jones in 1938 and was a simple grass strip in the middle of a large field back then, but is now a fully operational airport that hosts over 14,000 takeoffs per year, weather permitting. This facility contains 30 hangars and many different types of air crafts ranging from single to multi-engine jets. The demographic makeup of Huntingburg is not unlike that of most small towns. Upon completion of the census in 2010, there were exactly 6057 people living in the city. These numbers are comprised of 2334 different homes. This population data adds up to approximately 1.19 people per square mile. Racial makeup for Huntingburg at the time was 87.3% Caucasian, .5% African American, only .3% Asian, and 11.7% of the population was made up of other races. Latino and Hispanic population numbers measured in at 18.5 percent. 37% of the 2334 homes counted contained minor children, almost half of the population was made up of married couples. 29% of families had no adult males present, and nearly all households had 3 people in the home. The average age of residents in Huntingburg was 35 years old, yet 29% of the residents in this town are below 18 years old. Residents are also 48% male and 52% female. Crime rates are almost non-existent, and violent crimes that do happen here are solved very quickly. Huntingburg, Indiana was founded in 1837 by Jacob Geiger. Geiger bought almost 2,000 acres and made a home here. Though there is no official record, it is thought that the town got its name due to the abundant wildlife hunting and fishing in the area. In 1866, Huntingburg officially became a town and was put on the map by its permanent settlers. Though this is a quiet, often overlooked town, the Fire House and the town hall are the most important historical attractions to see. 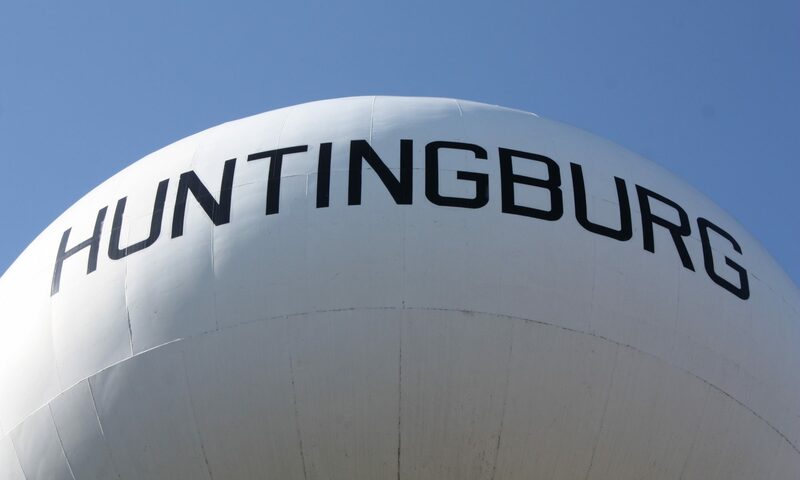 One fun fact about Huntingburg is that it was included in the central time zone for a period of 15 months, and then re-incorporated into the Eastern Time Zone in 2007. The political offices in this small area include the Mayor Dennis Spinner (Republican), Clerk of Courts and Treasurer Thomas Dippel, whose office is located at City Hall. The clerk-treasurer handles all things related to city employees and their payroll, making sure that any owed refunds are repaid, and that all of the city’s monetary assets are maintained and well taken care of. This position also includes the duties of backing up city council workers when court cases come about and when matters of public safety are up in the air. Keeping people up to date on current city ordinances, regulations, rules, and correcting city code violations. The city clerk also has to take care of making sure that all bills and fees are taken care of within the city. Huntingburg has a rather strong Chamber of Commerce, and this ensures that the city has a booming and growing economy. The Chamber of Commerce makes sure that the community itself is thriving and that there are many character-building activities planned to keep the spirit of Huntingburg alive and well. Events such as chili cook-offs, the Christmas tree lighting ceremony, Easter egg hunts, and many other community activities make this a very fun place to live for families. This quaint little city has produced quite a few famous people. Sports players Alex Graman, Don Buse, Ray Blemker, Mitch Stetter, Bill Menke, and Tim Barrett all got their starts in Huntingburg, as well as Otto Miessner who is a famous composer. These people are all testament to the quality of life in this area. Some of the best schools in the area are one of the main draws to the town, with many students heading to college straight out of high school. The City of Huntingsburg offers a very efficient, affordable transit system that costs $2.00 per ride ticket round trip with extra stops costing .50 each. This is one of the most helpful resources in the city because it makes getting to and from work or other places quite easy for those who can’t transport themselves. The transit system also helps the handicapped by providing rides via transit bus for those who need it. Housing in this are is also fairly affordable compared to other areas in the state due to the successful economy and high number of people in the work force. Average annual earnings for Huntingburg are around $48,000 per year and unemployment is low. Property taxes are less than 2% in the city of Huntingburg and people pay the same average amount of taxes per check as anywhere else in the state of Indiana. There are many things to do for fun in this area as well. Being such a family-rich area, four parks offer lots of room to run and play as well as a pool during warmer summer months. Lots of the aforementioned baseball stars got their starts on the little league fields located in these parks. All of these things considered, Huntingburg is quite a positive and beautiful place to grow and thrive.